Documentation – the life line to our work! 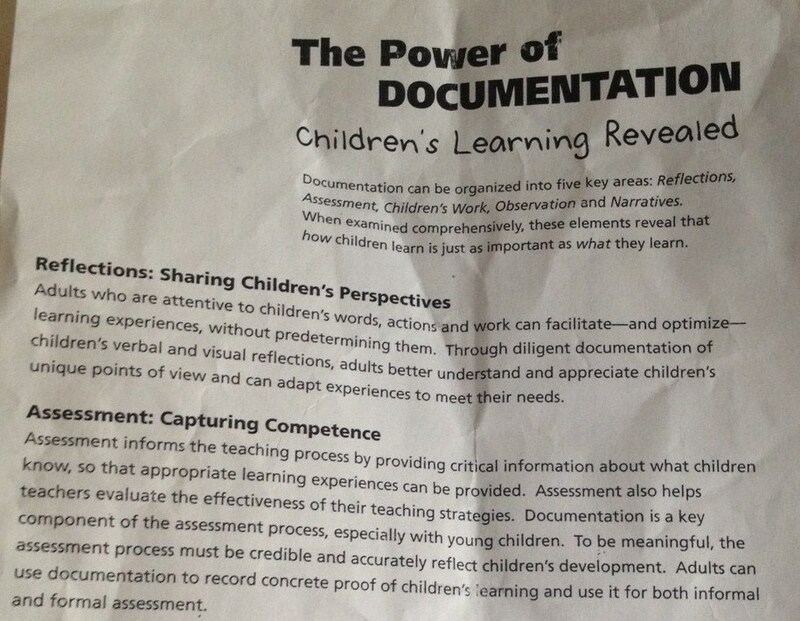 Progressive, play-based, and quality early childhood programs often use documentation as a source of sharing information with others and recording what children are learning. Communication and assessment are both critical pieces in the education field but how early childhood teachers and directors approach communication and assessment can be very unique compared to traditional school practices. 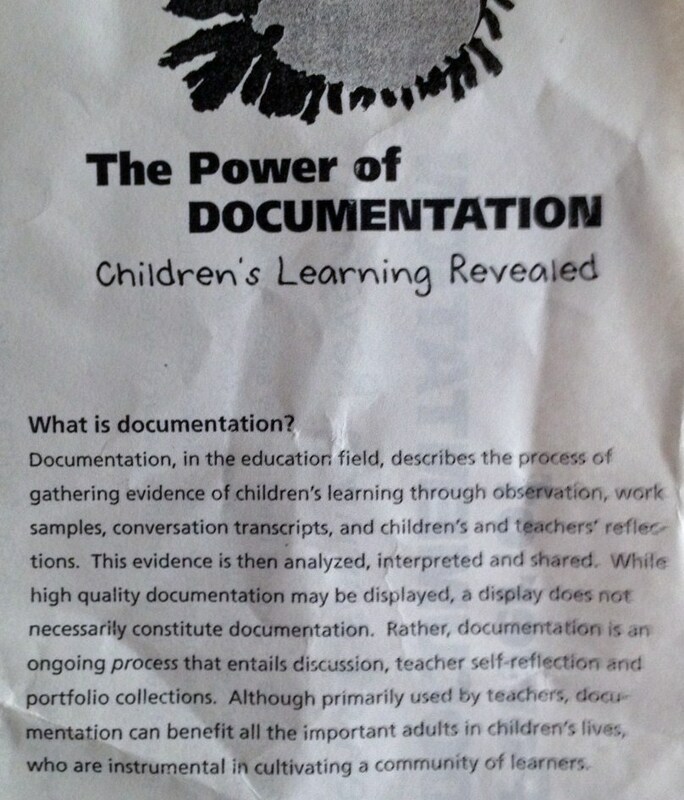 Documentation was a new concept to me many years ago while taking undergrad classes for my Education Degree. I was in an amazing infant and toddler course that asked us to create a photo tri-fold documentation of our observations during classroom field work. This was a challenge for me. Many of the teaching methods used at my field placement were breaking my heart and I had to deeply explore how I would document learning. I decided to do a broad spectrum of learning through play. While observing the children during free time and interacting with them during a few lessons I had done on play-dough and shaving cream my eyes were opened to how children were learning every second they engaged with their environment and peers. Suddenly all the child development research, brain research, and EC courses were making sense – I was watching it unfold in front of my eyes. As well as, watching it being challenged in a negative way in front of my eyes. My board showed children playing and learning:boys laughing and bonding over a dance in high-heels, children naming colors and textures with shaving cream, writing letters and drawing shapes with shaving cream and play-dough, engaging in narratives about family while molding play-dough people, peering through holes on the back of the shelf and figuring out covered holes were not visible, drawings of Mama’s and animals (labeled with Spanish and English vocabulary). All very solid indicators of learning and development. But the teachers viewed their state assessment packets in a very literal way. Circles were only counted as successful pieces if a child was sat down in a group and forced to draw one perfectly with a pencil. There were days I was ready to walk away – one particular day when a little boy cried until he threw up because he hated the pressure of the task so much. It is heartbreaking seeing 3 years old with so much anxiety about writing! Our job as EC teachers is to inspire writing and not kill it. That state assessment could have been satisfied with a picture of him tracing a circle in shaving cream to represent a cow head (bright smile on his face at the time) just as much as the written sample they were trying to force out of him. But often teachers fear the loom of assessments and feel the only way to get a piece of evidence is to sit a child down and have them perform the exact booklet described task. If they need to know a-z then I must have them point at a-z on a flash card and name them. When the reality is how many times in a week do you hear the children identify letters. Everyday my preschoolers are reading their own names, their friend’s names, the signs around the room, the letters in the play materials… and so on and so forth. Documenting (anecdotal notes, photos, work samples) daily happenings of the day can provide evidence for children’s learning. The reality is that documenting can be done in multiple ways. Choose a way that fits you, your program, and the children. Currently my program does a beautiful and well written newsletter every two weeks – documenting what the children have experienced and pulled from their experiences. Our photos and notes guide what interests we follow for planning curriculum and projects. We also use these gatherings combined with work samples to mark what developmental goals a child has achieved. 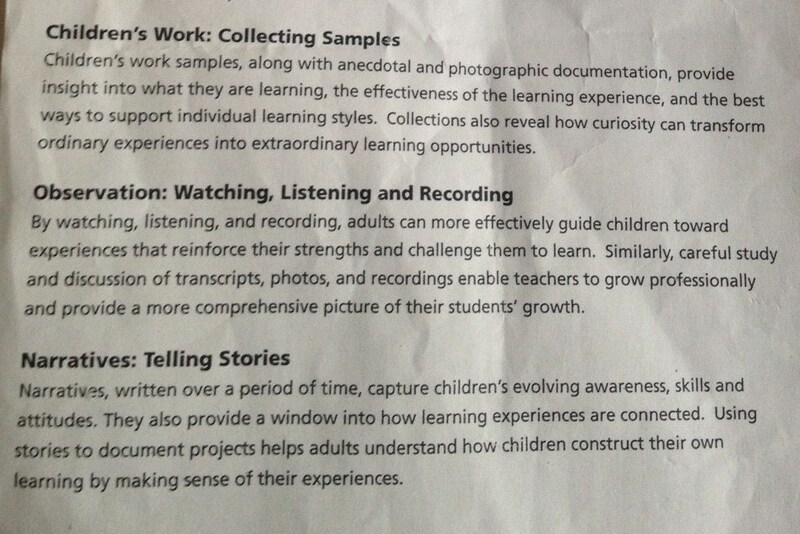 Documentation is about recording what the children do and say. It is important to write what they say verbatim so that what they know and what vocabulary they use is accurately represented. It is best to have a system and dedicated place for collecting documentations (camera, notebook, live-scribe, sound recording device, or some other portfolio for collecting written anecdotal notes). However, great opportunities happen on the fly and if you need to improvise then do! Don’t miss something great because you didn’t have the tools with you. 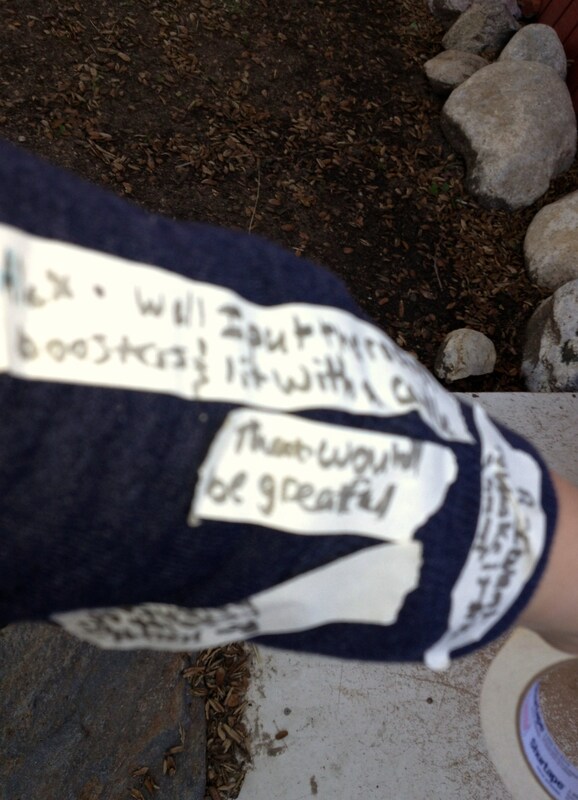 I have used a sharpie, with a sleeve and tape when necessary. Study the art of observation. Know what you are looking for. I recommend the book “The Art of Awareness” by Deb Curtis and Margie Carter. Also a mini resource to get you started is an article put out in a NAEYC publication called: “One Teacher, 20 Preschoolers, and a Goldfish Environmental Awareness, Emergent Curriculum, and Documentation” by Ann Lewin Benham – http://www.naeyc.org/files/yc/file/200603/LewinBTJ.pdf. Many resources on Reggio Emilia show a beautiful and meaningful way of capturing children’s work. A recent article I found that describes the Reggio perspective nicely can be found at: http://earlychildhood.educ.ubc.ca/community/research-practice-reggio-emilia. It is important to capture the joys of childhood and the deep learning children are doing. A picture says a thousand words but a note or recording paired with that picture clarifies what really is happening. – Did I record enough samples of child language to accurately represent the ideas they are sharing? – Did I describe or note key words from the event enough that I will remember what was happening? – Did I make note of the moment that represents growth, progress, skill, or personality (this is just as important as skill – did the event show us something new about how the child thinks or who she is as a person? We value children and not just academia). – Did I take photos that show progression of the project and ideas (not just cute photos). – Did I add my own bias or falsely interpret the happenings or am I sure that I am presenting clear and accurate evidence? A child that can match letters to letters (one to one correspondence and spatial/graphic relationships). He can sort from a pile of a variety of letters (letter identification and math). 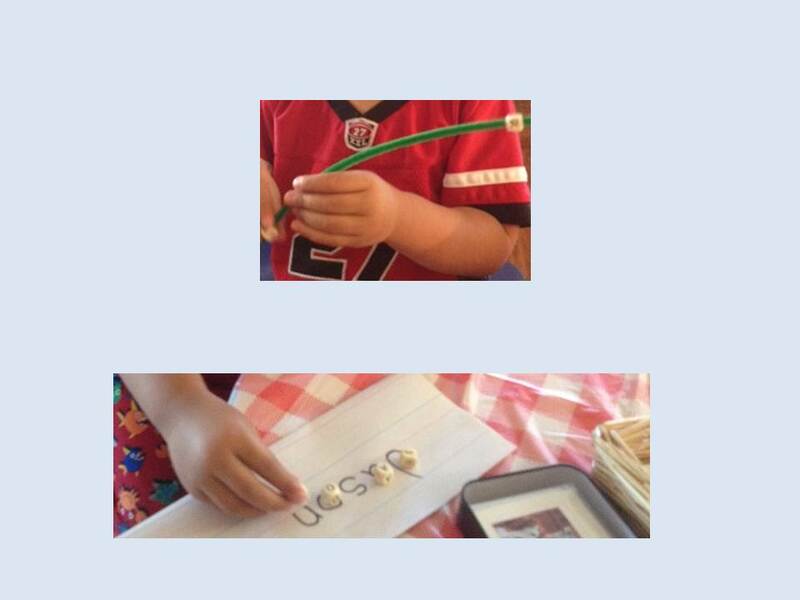 He can name each letter as he strings it (alphabetic awareness and fine motor). He can make the decision to put a different letter on his string but will say that he knows that the letter is not is in his name (self-awareness and independence). When asked he says that he did his name but he likes the other letters. He pretends they are shark teeth after completing the work and pretends to attack others hands with it as he laughs(joy, social interaction, imagination, and object representation). Now tell me a 10 minute worksheet or skill and drill activity can get more than that! Bring learning alive! Let them play! It is your job to stage the environment so that they will show you just how much they know. Your job is putting it down on paper and collecting supporting evidence. Last year I went to the National NAEYC Expo and one of the sessions I was handed this flyer on documentation (credit to the McCormick Tribune Foundation and Chicago Children’s Museum). I love it and had to share it! I encourage you to explore how you record and share what your children do. What do you use for meaningful assessment? Do you use documentation? Can you incorporate it? How can you improve how you track and share what children learn? What is your next step in the process? Documentation is hard. But, I feel it is the most authentic form of assessment I have found in the early childhood arena. It allows me to say Yes to play. Yes – you can work with real and meaningful materials. You can learn and grow. I will do my job of putting it on paper. I can’t support asking a child to do that job (unless it is a piece of their own written work or drawings). I can’t justify telling a child to abandon real work, tangible materials, and complex projects so that they can fill out a worksheet as a piece of evidence for a parent or the powers to be. I will do that part. I will translate the meaningful experiences they are having into evidence. If it must be on paper let me be the one to fill out that paper. The value of a child’s work must be honored in what they do and not only what they can put on paper with pencil. Learning is so much more than collecting bits of skills and information and regurgitating for others to see. Let’s let children do what they do best! They will show us what they know if we just give them time, space, and material.